Have I thrilled you guys yet with my new design for the living room? No? Well, to be honest, I don't have one. I spent all my energy designing the baby room, now I'm tired. And you know that I wasn't going to just go buy one. That, my friends, is WAY too easy, and a lot less interesting to blog about (not too mention, out of my budget). Can you imagine, if I told you about my rivviting trip to Bed bath and beyond? Actually that could be kind of interesting because they sell some crazy stuff there. Hmmm. Something to think about- I aim to please. Anyway, since I was not so inclined to trek over to BB&B and spend real money on a professionally made one, I looked all over the web for "how to's" to make one myself. Basically, my over simplified understanding is this: you take a regular coffee table, drill holes in the top for the tufts, cover it with foam/batting, then cover with fabric, then pull the buttons through the pre-drilled holes and ta-da, you have a new tufted ottoman/coffee table. Easy peasy. I already somewhat successfully made myself a tufted head board, how much different can this be? Once I figured out that I had the appropriate skills (hopefully), power tools and excitement, I started craigslist stalking until I found the right coffee table pop up. 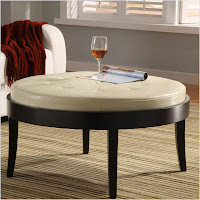 I e-mailed quite a few people who had round or oval tables on sale. My budget was $20 for the table, and I'm hoping I'll swoop up the other needed items with coupons from Joann Fabrics over the next few weeks. I figure, the whole project will cost less than $50 (crossing my fingers). In my craiglist perusals, I was looking for something with good legs. Yep, I'm a leg girl (on furniture that is). I figure that the whole top of the table will be covered with fabric so I didn't care what that looked like. I was going more for shape and for cute legs. I wanted ornate legs at first, but then decided on straight and clean lines, that go better with our couch. Plus, our leggy dining room table has some ornate parts, so I will let that guy steal the show. I found this guy and emailed them to see if it was still available. Now, looking at these photos, I am not exactly sure what drew me to this table. Perhaps it was the deep pink couch and carpet combo that off set it so nicely? Or the clearly-an-old-person's-house that it came out of? 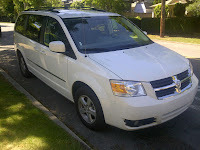 They were happy to sell it to me, but the catch was that I needed to go to Sammamish to pick it up, which was kind of a deal breaker (that's like a 40 minute drive). I told them I was going to be out of town over the weekend and that I wouldn't be able to make it over to the east side until this week. They were having a garage sale over the weekend and they said if they still had it after the sale they would let me know. Well lucky for me, no one else saw the great potential in this bad boy. But clearly, my CL friend, Anita, knew the potential and threw in a little mind game over email just for fun. Did you catch the mind game??? Did you notice how she said "you were the first," somehow making it sound like there were millions of people in line for this precious gem of a table (even though apparently no one wanted it at her sale). Those 4 words totally messed with my mind! 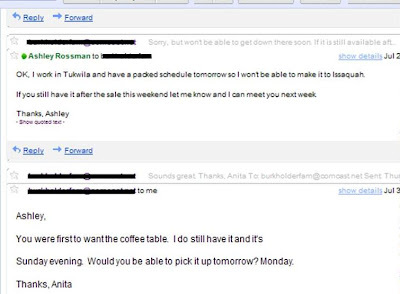 Good job Anita, you are a Craigslist rock star. I immediately valued this little guy way more than I had before. After all, I was the first of millions to notice his potential (I'm so smart). I was going to bargain her down to $10, but now I really wanted the table, and I didn't think that she would bargain, especially with all the people waiting with baited breath right behind me. 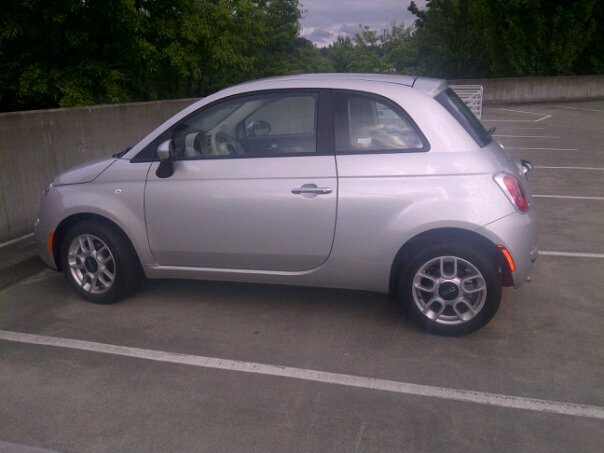 So I basically jumped at the chance to buy it for full price and drive all the way to Issaquah to pick it up. This is how you loose the game of Craigslist. So we set it up for me to come to Issaquah (slightly closer than Samammish) to swoop it up the next day. Now things go a little bit crazy. I should have known. Craiglist always = crazy. He has the table in the back of his car, which he goes on to tell me is a Buick. Then he explains he is going to keep it in his trunk instead of bringing it inside. He wants me to pick it up today before 5:30. Then he goes on rambling about any time would work, and that mornings and afternoons are good for him, and he could stay a bit late. Then he tells me I need to come to his work, cause he will be there all day. Then he hangs up and doesn't tell me his address. So now that I apparently have been handed off by Anita, to her dear and somewhat absent minded and rambling husband, which I am fine with, but I don't have the energy to call him back to talk to him for what I can only expect will be 30 mins of him telling he what model Buick he has, and what kind of gas mileage it gets. As I get out of the shower, my phone is ringing yet again with a new number. This time I figure I should answer before my voicemail is filled with 2 long winded messages. Surprise, another switcharoo. Anita is calling. She wants to let me know that I can pick up the table at her husband's work anytime today (hmmm.. clearly they didn't have a solid plan on who was going to call me). She is slightly more coherent on the phone, gives me the address and even some vague directions. When I tell her that I'm not sure what time I will be there, she tells me that it would be best if I work with Sabrina instead of her husband. According to her Sabrina will be in the office all day and can sell me the table out of the back of the Buick (not creepy at all). I get to the office and ask for Sabrina, which I assume is some sort of assistant to Anita's husband. The 2 well dressed older women look at me very awkwardly, and exchanged some very strange looks and eye rolling. Great, I get to deal with rude receptionists. They come back and tell me Sabrina will be right with me and continue with their marathon eye rolling. You can imagine my surprise when a 9 year old girl in pig tails who was the spitting image of Punky Brewster walks through the door, extends her hand to me and says "You must be Ashley, you're here for the table right?" She escorts me out to the Buick, while I pick my jaw off the floor. She pops the trunk and starts describing to me the many wonders of this coffee table just like a car salesman. Man, this kid is good. Can I please mention that this Anita person is a GENIUS! Seriously, first the mind games and now having a small adorable child sell me the table.... this lady is freaking amazing. How do you say no to a child? Heck, if she had upped the price on the spot I would have had not choice but to say yes. No one says no to Punky Brewster, in pig tails no less. Then she offered to carry the table to my car! I felt like I was being punked. I actually didn't know what to do, so I told her I could carry it, and offered her the money. She thanked me, shook my hand again and offered me good luck with the table, saying she was glad it found a good home. What the ****?? Am I talking to a 40 year old trapped in a small girls' body? This was the most grown up, 9 year old version of Punky Brewster that I had ever met. I tossed the table in the back of my rental car and drove off, seriously flabbergasted by what I had just encountered. Side note- I had a rental car because Chris' car was in the shop AGAIN. Seriously people, don't buy an Audi. You look super cool all the time, unless they are broken and you are driving a mini van, or a Fiat. Seriously. I have had both of these rental cars in the last month- what are the chances. Am I being punked again?? I felt like I was driving a shoe around. Do I look cool in this? ﻿﻿﻿﻿﻿Anyway I had to go to work and then had some errands to do. I had to return the car that night and completely forgot that the table was in the back of the car. Woops. I am apparently the most absent minded person on the planet. 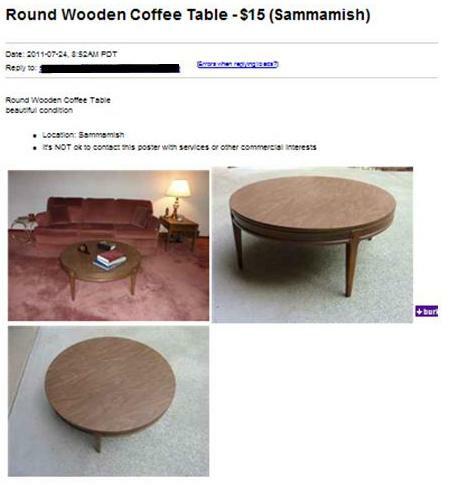 So then I had to call all over town to track down my lost craigslist-coffee-table. Let me tell you. It's a very strange thing to call the car dealership, then the rental car place and explain that I left a coffee table in the back of a car. Yep, that's me. The crazy one. I didn't leave my sunglasses or my cell phone, both small items that are easily lost. I left a huge piece of furniture that I drove all over town for! How do you forget that? To make matters worse, I call to claim my missing property from the rental place only to find out that they rented the car to another person out of their Kent office, and that my table is waiting for me down there. Now i had to head 20 miles out of my way to pick it up... again! Ugh. I think I have spent more on gas to pick this darn table up, than I did to buy it. I finally picked it up and the dudes at the rental shop were laughing at me. Classic. When i finally got it home and put in our living room, I realized it was all worth it. See our new rug? More on that tomorrow! This table rocks. Score one for me, my $15 table and my $30 in gas. PS. You can now sign up to receive email alerts when there are new posts. Just enter your email address under the "blowing up your inbox" section.